Installing a dishwasher is typically a straightforward process. Most mechanically inclined people with a basic understanding of the plumbing and electrical trades, will be able to install their own dishwasher. These days more and more people are purchasing their appliances online. There are both positive and negative aspects to purchasing an appliance online. Often the best deals can be found by purchasing a dishwasher online. However, there are some drawbacks to purchasing a dishwasher online. Such as: the delivery companies will usually only deliver to your front door, not to your kitchen. They provide little to no installation help. No help with the removal and disposal of your old dishwasher. This leaves you with two options, install the dishwasher yourself or hire a company that specializes in appliance installations like, Great Seneca Appliance in Frederick, MD. People often ask me how to install a dishwasher. Here is a brief tutorial on the process. Start by having a friend help you get the dishwasher to its location and unpack all parts provided. Next remove the existing dishwasher by unscrewing two screws at the top attaching to the countertop. Then remove the bottom plates to access underneath the dishwasher. Now turn the water supply off to the machine and disconnect the water supply line. Often the supply line can be disconnected underneath the dishwasher in the front. Then disconnect the drain hose from the sink drain or disposal depending on your particular set up. Next, turn off power to the dishwasher from your circuit breaker box. Then disconnect the power supply. After everything is disconnected the dishwasher can be slid out from its opening. Now you are ready to install your new dishwasher. Start by unpacking everything inside of the dishwasher and looking over the manufacture's supplied directions. Connect the wasteline to the bottom of the dishwasher if not already installed and then to the bottom of your sink. 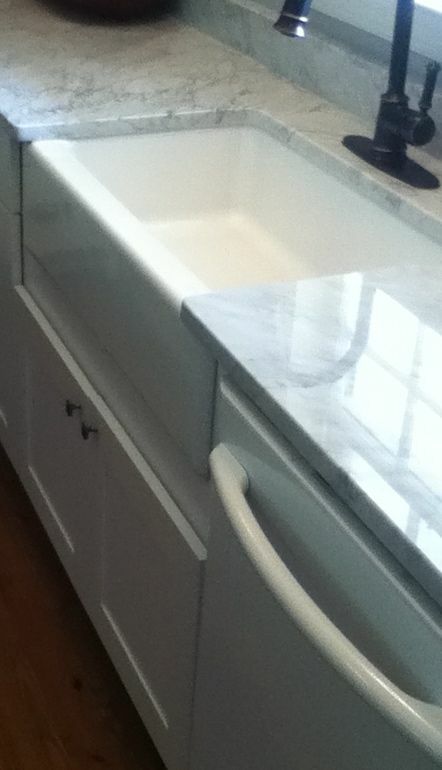 Next slide the dishwasher half way into its permanent location and pull the drain hose under the sink avoiding kinks. Now push the dishwasher into its permanent location and install the 2 mounting screws into the countertop. Connect the water supply line and connect the electrical supply to the control box of the dishwasher. And remember black to black, white to white, and green to the bare ground wire. Make sure the drain hose has an air loop by arcing above the drain sink connection. Now double check all connections and turn the water supply back on.